This pretty garland will add a bit of sweetness anywhere you choose to hang it. 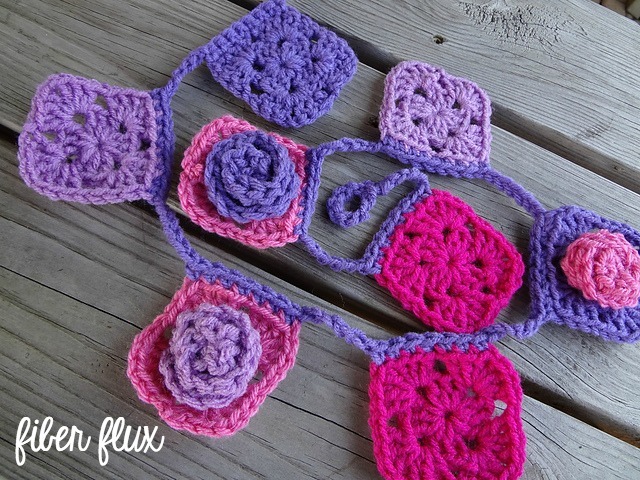 Small two-round granny squares are topped off with lovely roses and are connected easily for hanging. Each square measures about 2.5 inches wide, and each rose is about 1.5 inches wide. Make the garland as long as you like by making more squares. Chain 12, dc in 4th chain from hook, then work 1 more dc in that same chain. Work 3 dc in each chain until you reach the end. The flower will coil up on it own as you work, then fasten off and seam it together. With yarn leftovers of the same color, sew roses to squares. You can sew one to each square or one every couple of squares like I did. Weave in any ends. 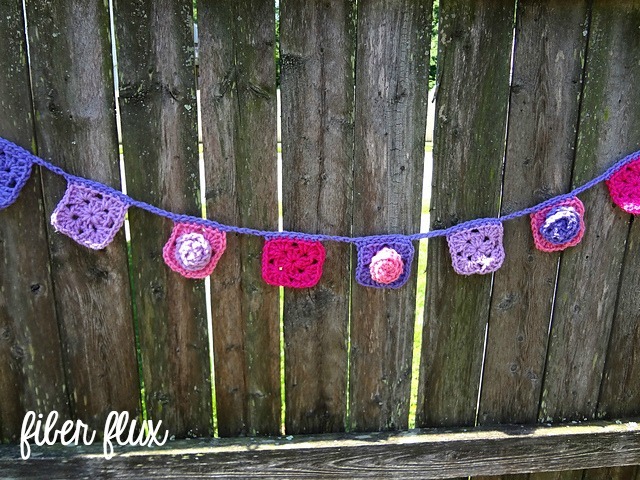 Begin by crocheting a hanging loop. Chain 8 and join with a slip stitch for form a loop. Work one sc into the center of the loop. Then chain 6, and you're ready to attach the first square. Note: If you want your grannies to be spaced closer together or more apart, simply make more or less chains in between. Insert the hook in both edge loops of the square, and work a single crochet. Keep working a single crochet in each stitch all the way across the top of the square until reaching the end. Chain 6, and you're ready for the next square. 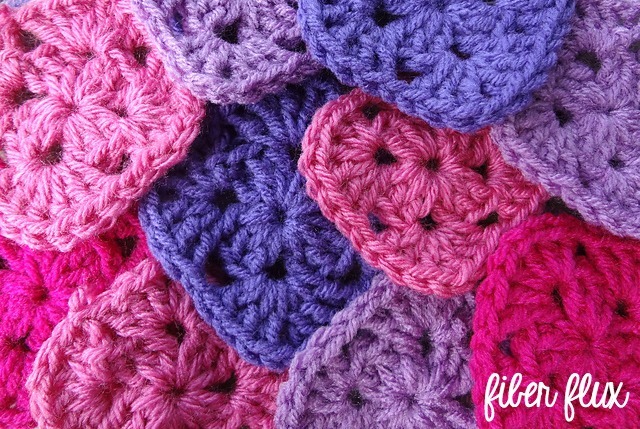 Repeat for this square by working a single crochet in both loops of each stitch all the way across. Continue for as long as you want your garland to be. Finish by working a chain 6, the chaining 8 more. 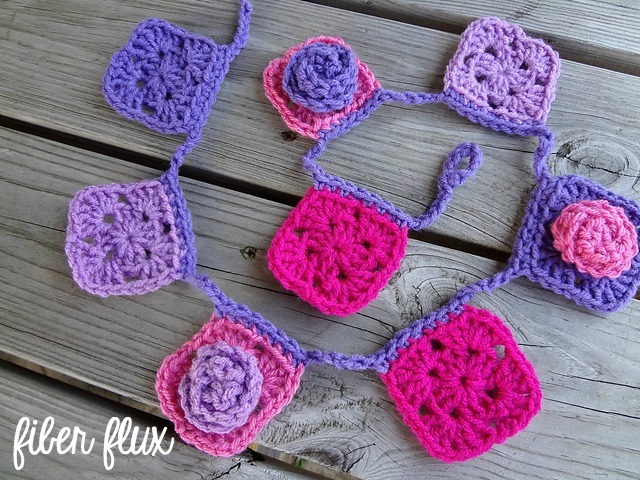 Join with a slip stitch in the 8th chain from your hook to make a circle. Work a single crochet into the center of the ring. Fasten off and weave in ends. Adorable! Thanks for Sharing! Love your patterns. Unfortunately there are no pictures for this pattern. I would still like to have a go at making it. From the description it sounds like it would be a fun project to try. I actually knit and crochet for therapy for an anxiety disorder and my new granddaughter has enough blankets, hats, cocoons etc to take her safely through the next few years. I have tons of scraps begging to be made into something for Nanny's play area. Thank you for taking the time to create this pattern.